Vision: We’re forming a sustainable community with Songaia Cohousing, creating a new kind of welcoming neighborhood committed to lifelong care for the Earth and each other. You are invited to learn about our progress in building community on land adjoining Songaia Cohousing. Our vision is to encircle Songaia with neighbors who value community life and our lovely land, and who want to create new possibilities. 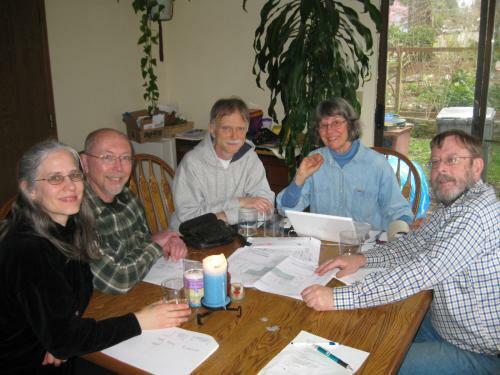 About Songaia: Songaia Cohousing is a strong, established community of 38 people in 13 homes on 10.6 acres. Songaia completed its 10-year, self-developed project in 2000—we live in modest homes with abundant land and common facilities near Seattle. Songaia is multi-generational, ages 3 to 72, with only two resales since 2000, one to a New Earth Song member. Project: Our vision, values, mission, and scope are coming into focus due to our work and that of our consultants. We are self-funding early phases. One adjoining property has been purchased, and we are planning to develop it into a six unit cohousing community. 1. Membership process defined—to help new families understand our vision/plan. 2. Development legal structure (LLC) registered with Washington State. 3. Startup funds raised; more is committed. 4. Half-acre with three-bedroom house bought by subgroup as site of development. 5. 10-week Aging in Place study group completed with six Songaia families. Costs: LLC members have committed several thousand dollars during the formation. 1. Join Songaia Announcements mailing list on the Songaia website to be notified of public events, open houses, tours, etc. 2. Contact us, take a tour, come to a meeting and consider membership. This "Finding Community" interview of Diana and New Earth Song's Craig Ragland also discusses Songaia and New Earth Song Cohousing, including Adult-Focus and what that means to us. Scroll down the page to find the interview next to the picture of the "Finding Community" book. Note: this fine book is available through the FIC Store. the community next door - sign up on Songaia's homepage for Songaia Announcements to hear about our project's open houses, tours, etc. Check out Songaia.com to understand more about the context from which New Earth Song is forming.